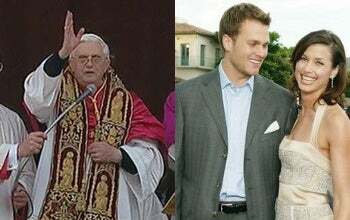 The father of the New England Patriots' two-time Super Bowl MVP quarterback studied seven years to be a Maryknoll priest before deciding to leave the seminary and later having a family. Q: You have a deep love for your faith. Has [your son] inherited that? A: He's not in the seminary. That doesn't mean that he doesn't love it every bit as much. Absolutely, it's an important role for him. So ... all we're saying is we'd like to be a fly on the wall during Easter dinner at the Brady home this year, just to count the awkward silences. Meanwhile, at the Vatican, they're scrambling the fighter jets as The Pope is choosing his tallest, most bejeweled hat. This is the one they've been training for. This time, it's not a drill.